It started as a suggestion. Then it became a persistent request. I felt it even when it wasn’t there. The need for turducken was growing. 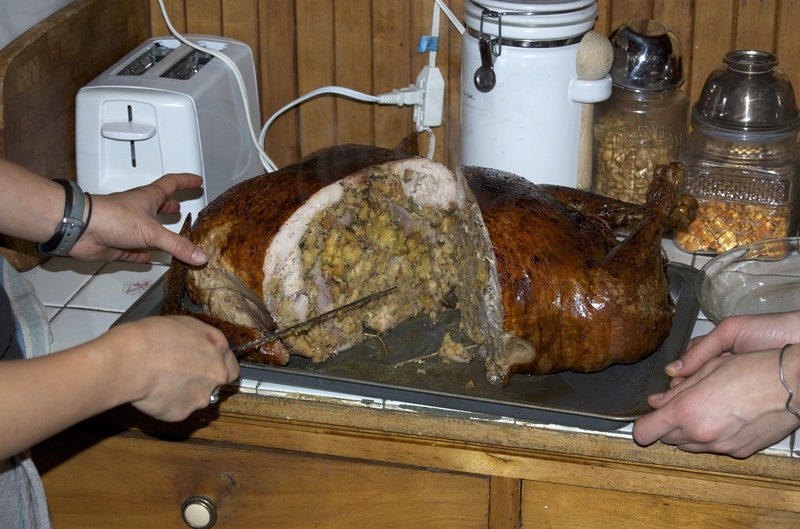 A turducken is a chicken stuffed inside a duck, inside a turkey. 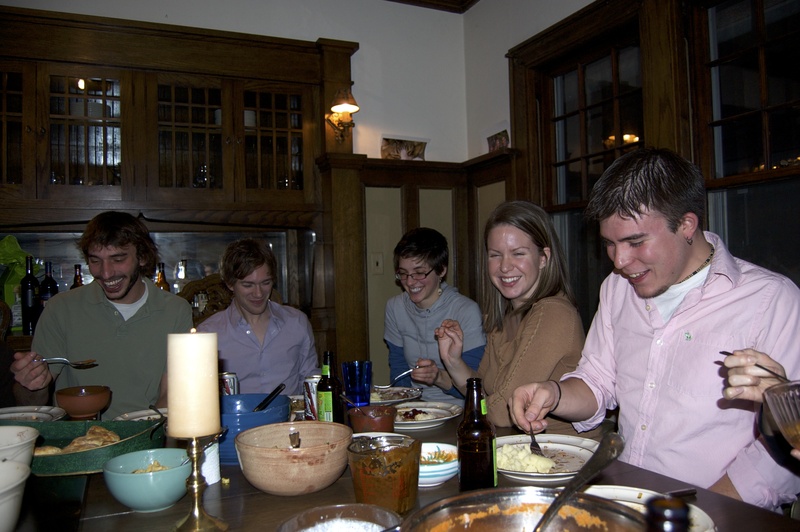 For a year I had been advancing my culinary skill on non-critical friends once a week. 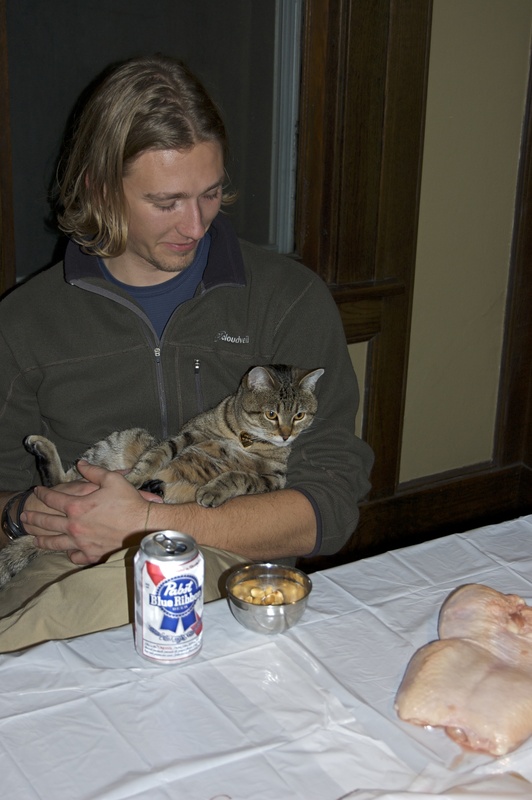 One turducken infatuated friend kept pushing the idea my way. At first I had just said “No.” Over and over again. Eventually my curiosity was piqued. That was the mistake. Once I started the research I couldn’t be stopped. I scoured the internet. Five years ago, I didn’t find that much. There were butchers and small groceries that would assemble it for you. Just a handful of brave souls were doing it from scratch and posting about it. The Road To Turduken was my favorite story. I set a date, required RSVPs and cash, then took three days off of work to do the beast. 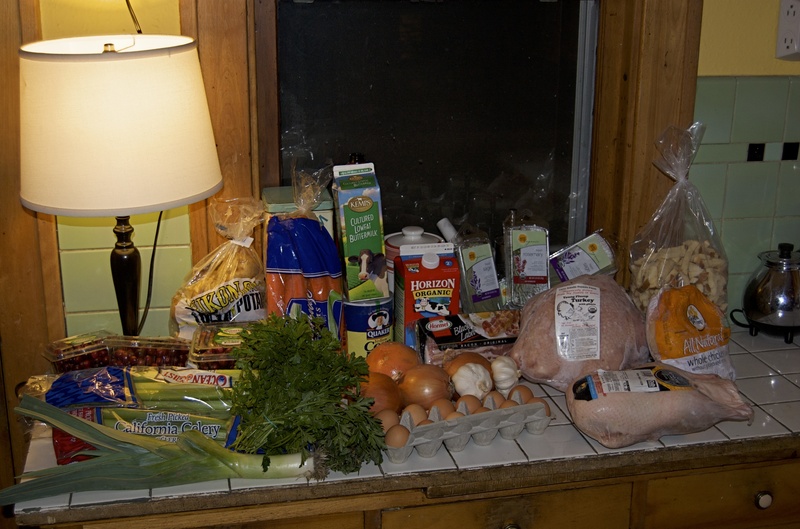 On the first day I grocery shopped. Those can’t be my groceries! What was I doing buying a Gold’n Plump chicken?!? Hormel bacon??? No way. This is some strange way to time travel to my younger self. 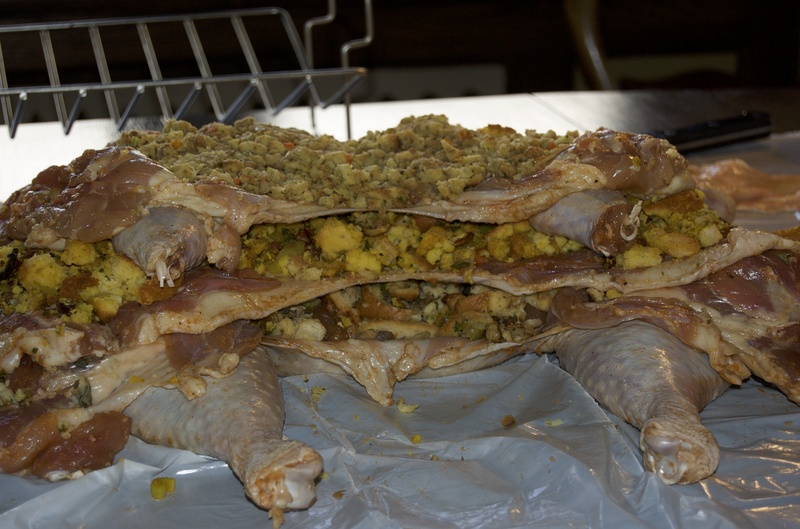 On the second day I made three stuffings in the morning, and deboned three birds in the afternoon. 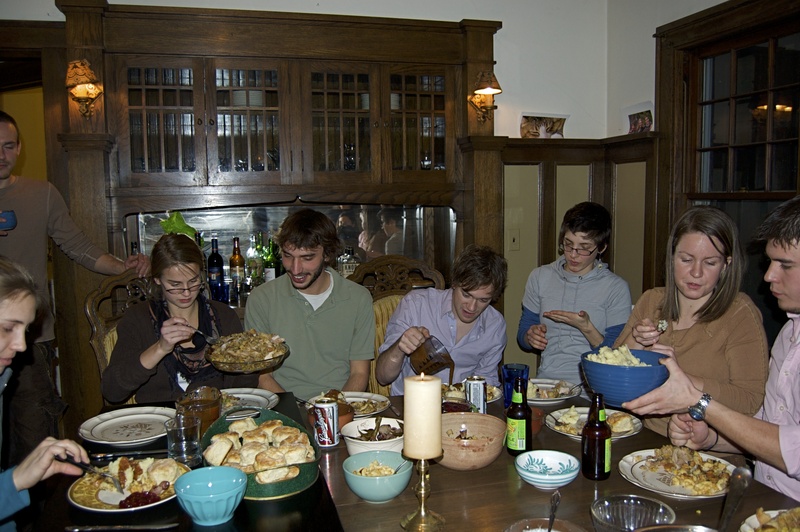 The top left was the traditional oyster sausage stuffing. 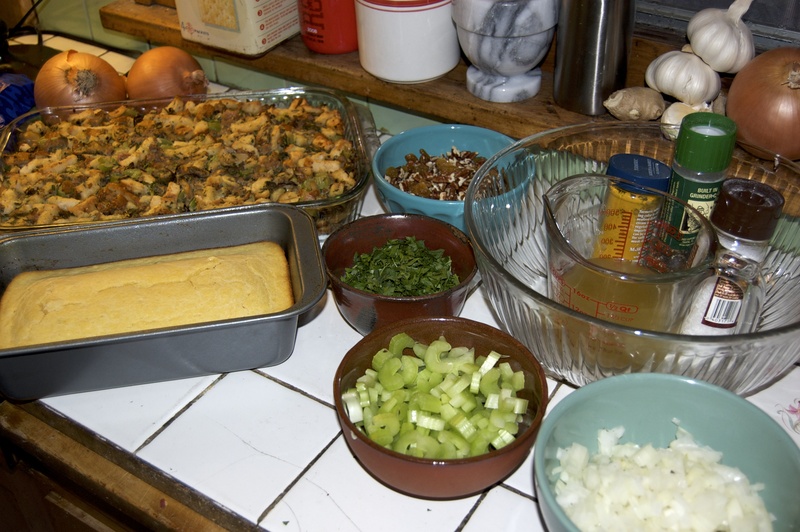 Bacon cornbread was up next. 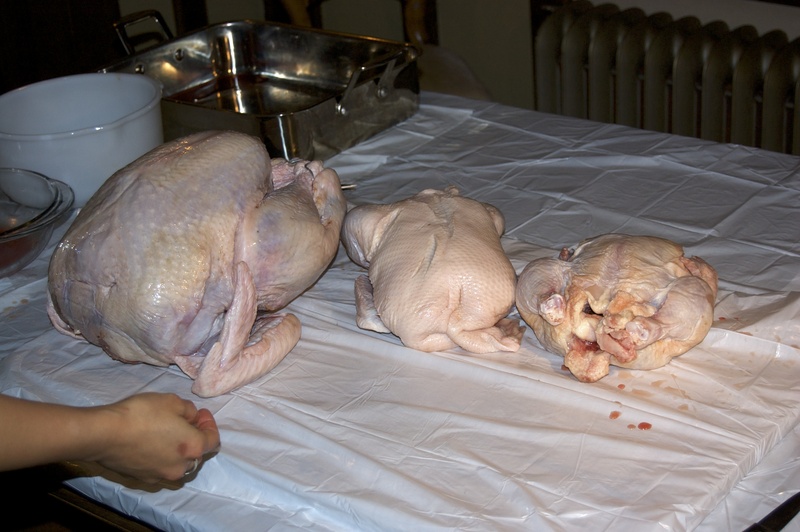 Deboning took four hours. This was by far the hardest part. In addition to research, I had practiced. I had bought training chickens the month before. Breaking joints, with a headlamp. My spectators and pit crew. Somehow I hadn’t found Pepin’s amazing deboning skills. I’d like to believe it would go much faster now. Man, I could get lost in Jacques Pepin and Julia Child YouTube videos… Try it, I dare you. 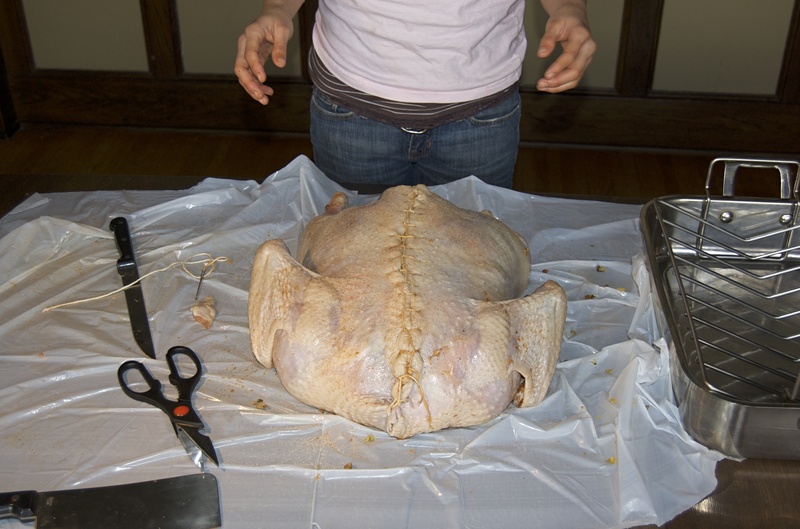 On the third day Will and I assembled the turducken. Bottom to top: Turkey, sausage oyster stuffing, duck, bacon cornbread stuffing, chicken, herb stuffing. Seasoning between all layers. It took both of us to stitch it up. My dad’s knives and digital meat thermometer. My future mother-in-law’s roasting pan. My neighbors oven. Our’s was too small. 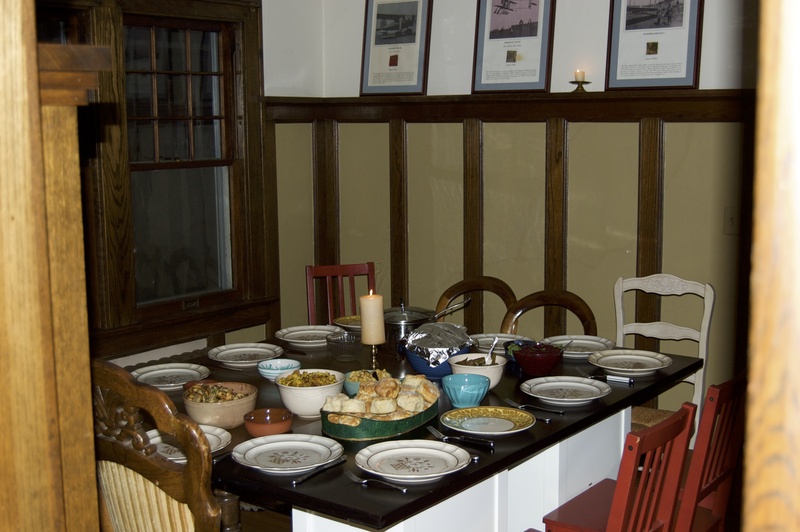 In the meanwhile I cooked the sides and we got the house ready. That’s a desk added on to the dining room table. We also had to borrow chairs. It’s like a magic trick! In the end it was a feast fit for kings. Or a bunch of drunk 20 somethings. The friend who started it all is the one pouring gravy from the plastic pyrex cup. We were real classy. Thank you Jeff for poking me until I made it. It was totally worth it. Which later lead to the Ultimate Pig in a Blanket. I’m not sure what will inspire me next. Any ideas? 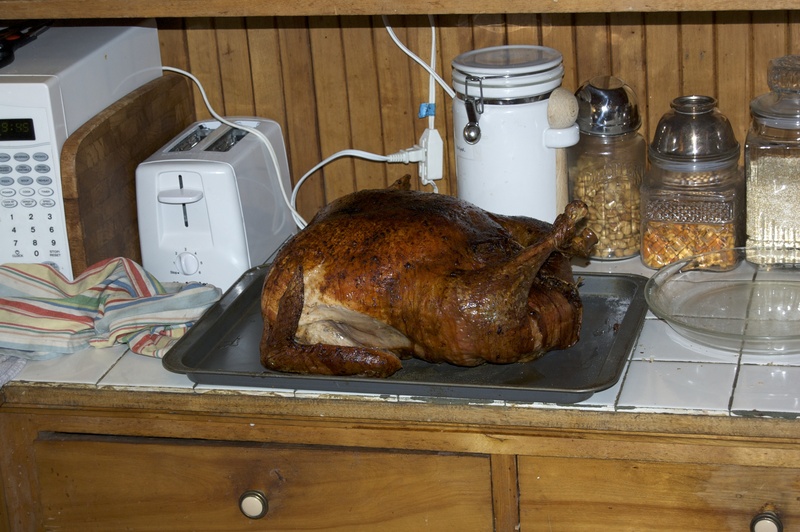 This entry was posted in Kym Cooked and tagged challenge, chicken, culinary adventures, duck, food, meat, turducken, turkey. Bookmark the permalink. OMG so impressed. 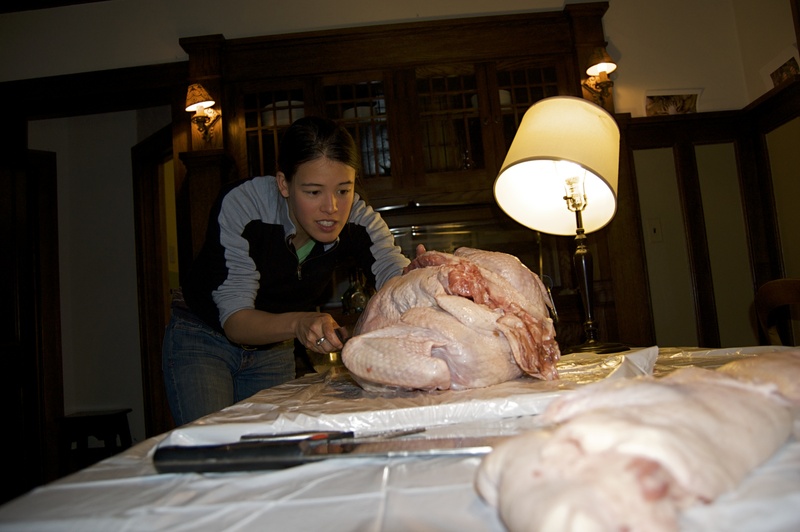 Your efforts are a combination of butchering and surgical skills resulting in culinary magic. Congratulations and Happy Thanksgiving! It does feel magical what ends up happening. Although lots of cooking can feel like a magic trick. I would be a terrible surgeon. To sew up the thing Will had to use his forearms and hands to clamp it together. Thanks for reading 🙂 Have a great Thanksgiving! I especially love the “Meat is murder” t-shirt. And thanks for reinstating “turducken” in my vocabulary! I’m still shaking my head in amazement that you DID IT!